You may well know that Hugh Fernley-Whittingstall is my life style guru. He’s definitely been an inspiration in how I want to live my life. 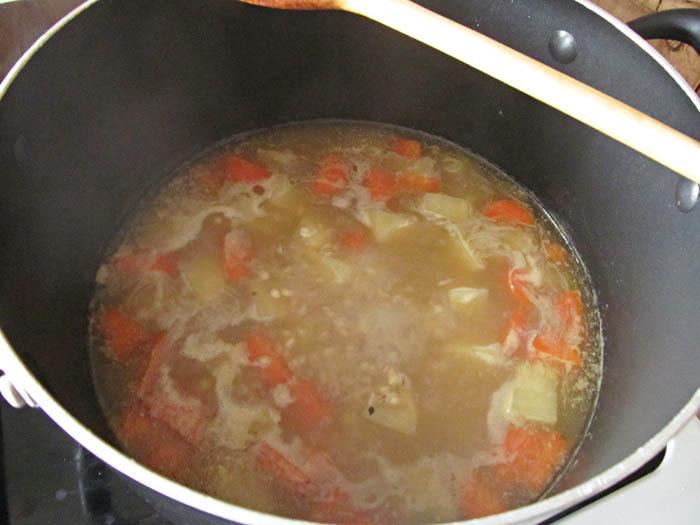 This soup came about because of being reminded about how you can clear your fridge of any aging vegetables and make soup. Not that I need reminding really but it does help and I do get a sense of achievement when I’ve done it. 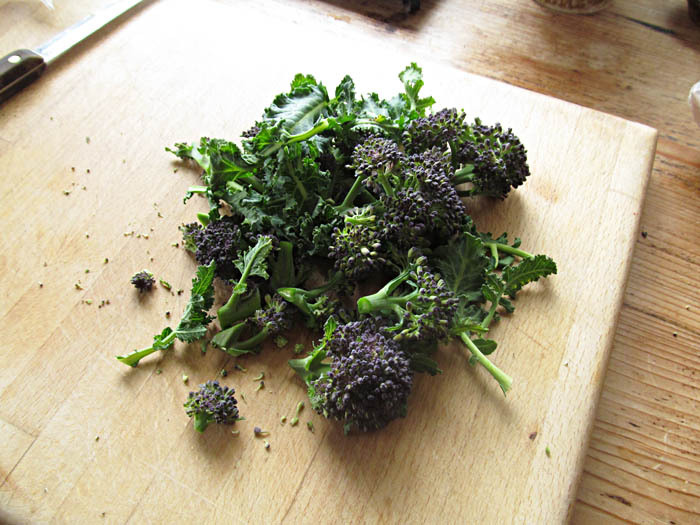 I had two broccoli heads I had bought that had been reduced for about 25p each and I hadn’t had a chance to use them. I decided It was possible to make some soup. After frying some onions, garlic with a little celery salt (you can use normal salt) and a couple of carrots, I broke up the broccoli and popped it in the pan and added enough stock to just cover the veg. I cooked it until the veg was tender and then whizzed it up in my blender and put it back in the pan. I had a little soft goats cheese in the fridge that needed using so I popped that in. 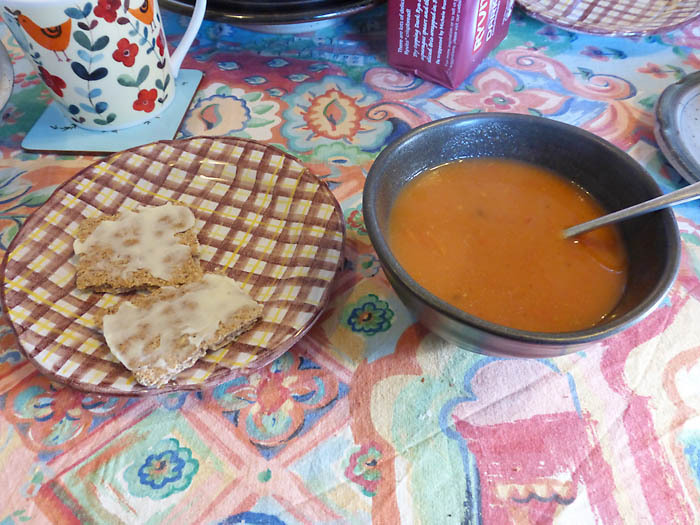 It’s definitely soup weather! 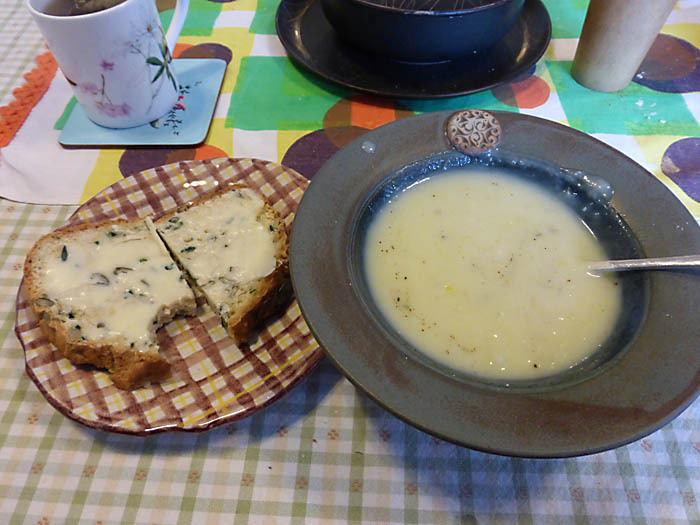 I just made some Leek and potato soup and although I’m quite an accomplished soup maker, I like to do a bit of searching in the internet for new ideas and ways of doing things and also to be inspired about using odd bits and bobs that are in the fridge. 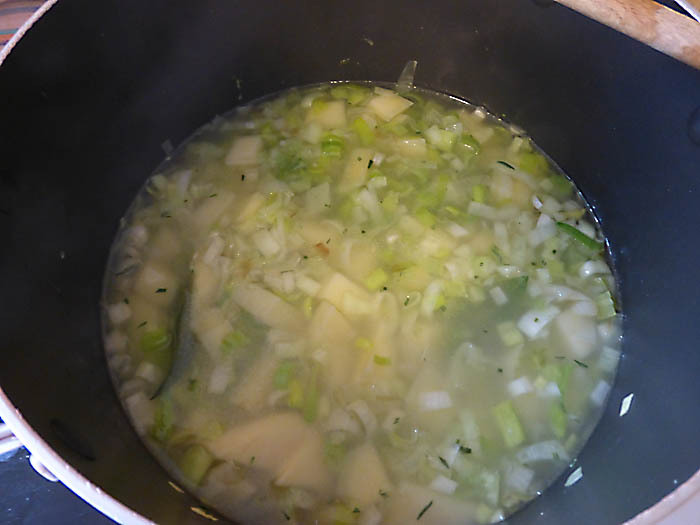 In here are two leeks and a quarter of a fennel bulb that had been tucked up in cling film waiting to be finished off. I added a little chopped (tender) rosemary and two bay leaves from the garden, also six pepper corns. 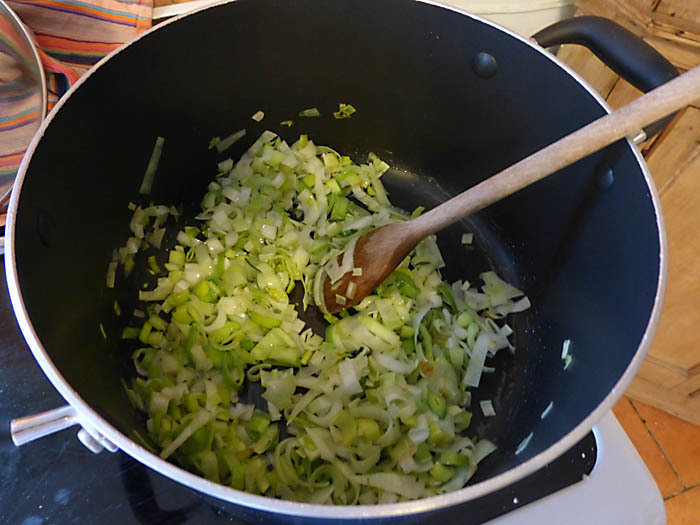 Oh yes and a small clove of garlic, finely chopped. I just added half an organic stock cube with the amount of liquid I wanted (stock cubes do tend to be salty). When its cooked, season to taste and whiz up in a blender! 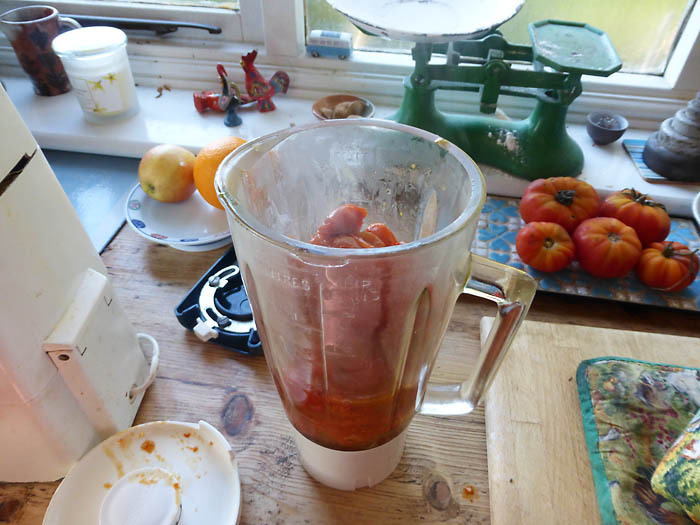 Just a little tip on how easy it is to make your own tomato soup. I still have tomatoes in the fridge from late ripening so I decided to make some soup. 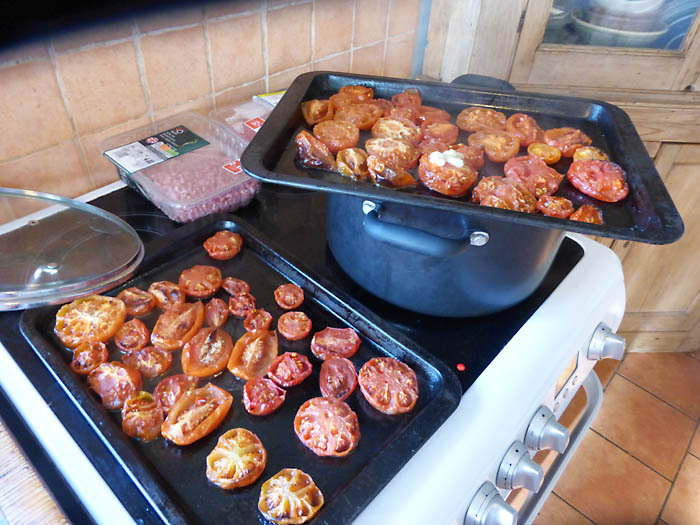 You can make this out of shop bought tomatoes, especially if you manage to get them at reduced price. Slice them all in half and lay on an oiled baking sheet with some herbs and perhaps garlic. I used rosemary and oregano. put in the oven on 180C for about 30mins. Quantity of tomatos is up to you as left over can be eaten the next day or frozen. When they are nice and crinkley, whiz them up in a food processor…. Put into a pan with some chicken or veg. stock. 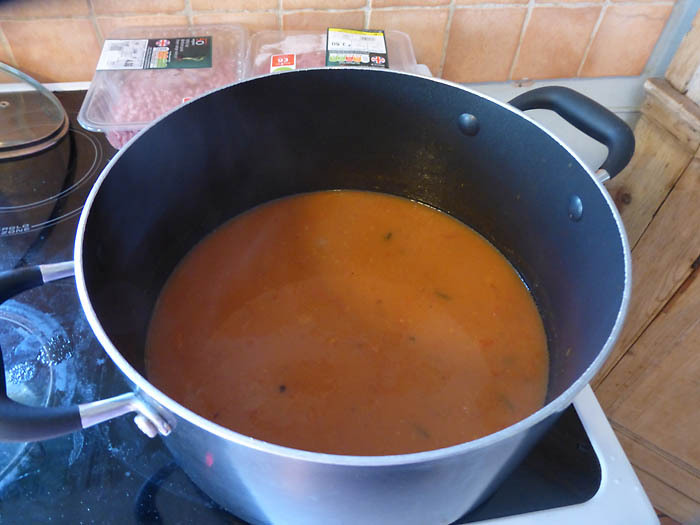 The amount is up to you again as to how thick you like your soup. 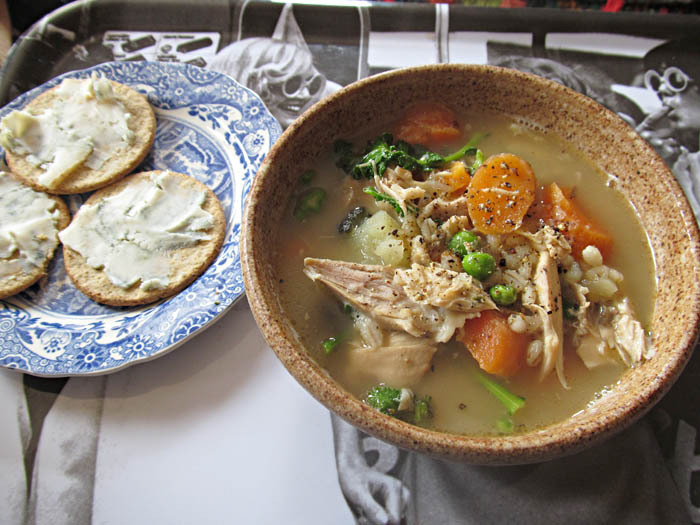 I know I’ve posted this before, but I’m amazed how easy it is to make such an economical, nourishing and tasty dish. Anyway it comes out different every time! 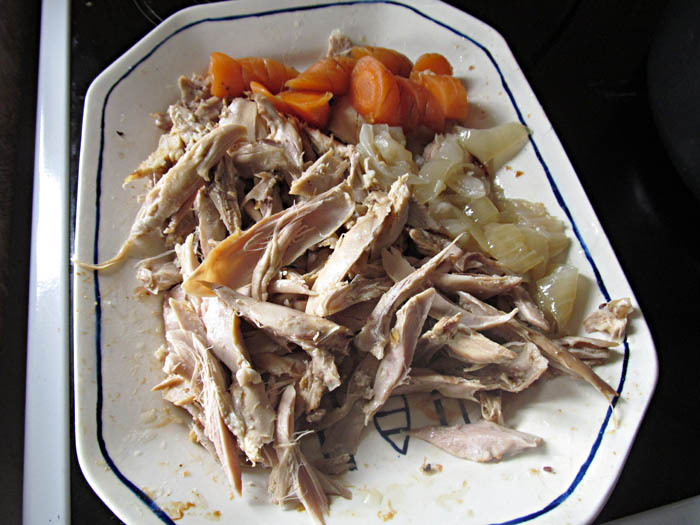 Make chicken stock by putting the carcass, half an onion, a carrot snapped in half, a bay leaf (if you have one, if not it doesn’t matter), a few pepper corns, salt and pepper and a kettle of boiling water and simmer gently for an hour. Leave to cool a little then stain the lovely stock and get all the chicken you can off the carcass. 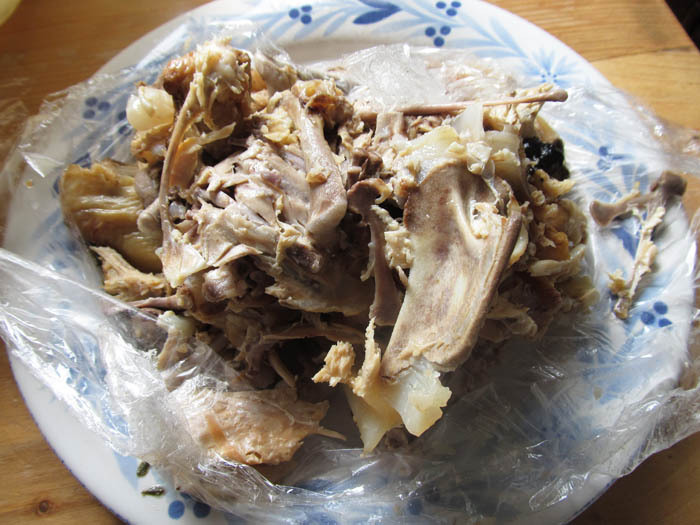 This is what is left of the carcass once all the meat is taken off….. Put the sock in a large pan and put the chicken etc into the stock. Add extra veg of your choice eg potatos, peas, extra carrots etc. simmer until everything is cooked. I added some bits of brocolli as well shortly before serving.